We get a lot of questions on how the payout schedule works for our pay as you sell (IV,II) Co-Ops. Because of this, we have updated our timeline tab to better communicate the schedule. The core of the Kickfurther model is consignment. This means that a business is billed based on when they make use of the funded inventory for any purpose (sale, sample, promotion). For Pay As You Sell (IV,II) Co-Ops this is assessed when the inventory leaves the warehouse facility designated by the business to Kickfurther during the Co-Op's construction. Breakage and units declared unsellable are also invoiced. Inventory Available. Each Pay as You Sell (IV,II) Co-Op will designate an "Inventory Available" date which is when the business expects the funded inventory to be in the designated warehouse location, following any necessary production and shipping lead time. 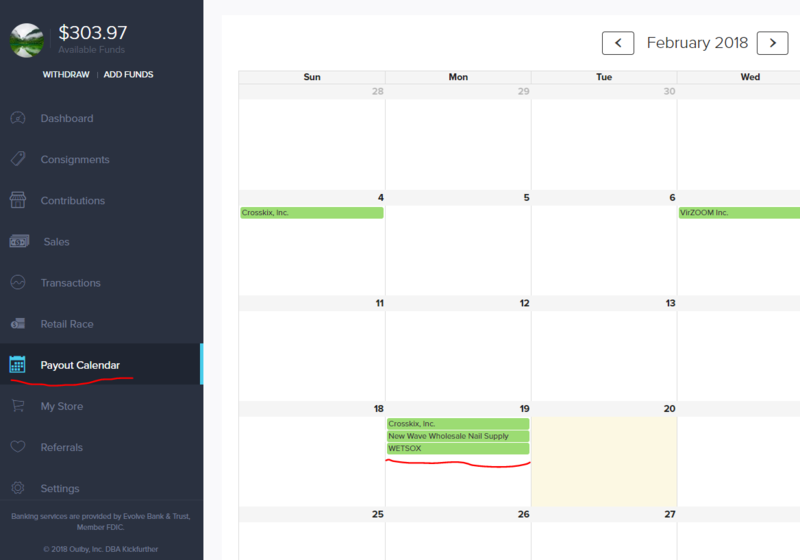 The Inventory Available date will be set based on the earliest available inventory in the case of different inventory arrival dates. Selling Periods. The Selling Periods are 15 day periods. During these periods, the business makes sales of the inventory and then Kickfurther invoices the business for the inventory sold as explained below. Selling Periods formally begin following the Inventory Available Date*. *If the funded inventory arrives earlier any sales prior to the projected Inventory Available date will be included in the first Selling Period invoice. Invoicing. At the end of a Selling Period, Kickfurther obtains a product specific sales report either from the designated third-party warehouse provider for an Inventory Visibility (IV) Co-Op or from the businesses internal warehouse management system and corroborated by in-person inspections if it is an Inventory Inspection (II) Co-op. Read these posts for more information on invoicing of Inventory Visibility vs. Inventory Inspection Co-ops. Kickfurther generates an invoice from the sales report by multiplying the number of each product sold by the agreed upon mark-up called the Revenue Share price. Payment Terms. Payment Term is a period between the end of the Selling Period and the invoice due date. 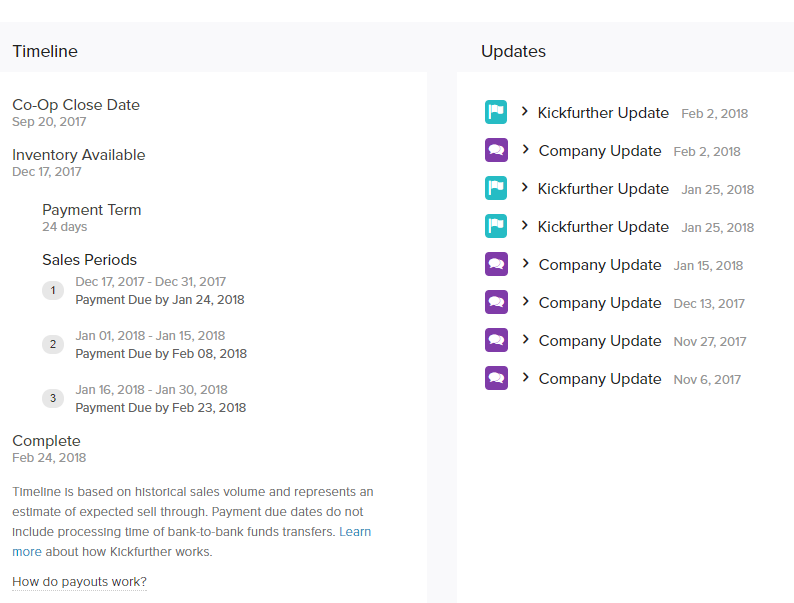 The default payment term for a Kickfurther invoice is 14 days from the end of the Selling Period. The Payment Term can be longer for businesses that can demonstrate that they sell inventory to customers who pay them on payment terms. This is done to minimize situations where a business owes money to Kickfurther Buyers for inventory that was sold but for which they have not yet received payment. The buyer page once you have contributed to a Co-Op. All of the above is consistent with Kickfurther invoicing policies since the release of Pay as You Sell Co-ops (IV,II). We hope the schedule updates are helpful in understanding Co-Op schedules going forward.